The B2FS is a semi-automatic, two station rotary combination blister forming and sealing machine. It uses pre-cut plastic sheets which are formed and then sealed on the same tool for a variety of pre-cut lidding materials ranging from aluminum foil, paper, sterilizable backing and blister cards. Tool #1 with the finished /formed blister is now ready for loading the product and lidding stock. While sealing is being done on tool #1, tool #2 is being loaded with product and the lidding stock after which the table is rotated, the finished product is removed from tool #1 and you are ready for the second cycle. Heater Plate Size: 7.5" x 11.75"
Production Rate: Depends on the Material. Up to 6 Double Cycles per Minute. 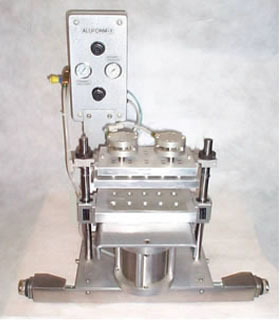 Alu-Form2 is a compact aluminum cold forming blister machine. 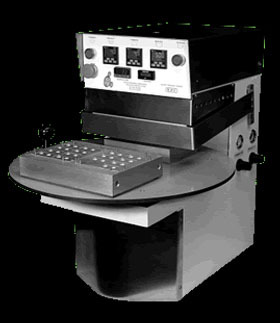 This machine is ideal for small runs, such as clinical trials, product development, marketing samples and material testing. The machine is built to allow for easy change over which usually can be accomplished in less than then 30 minutes. The tooling is manufactured as a set and marked accordingly. The machine is equipped with a safety feature that requires two hand operation.